It was a last Tuesday morning, September 1, 2009, when I received most shocking message on YM. 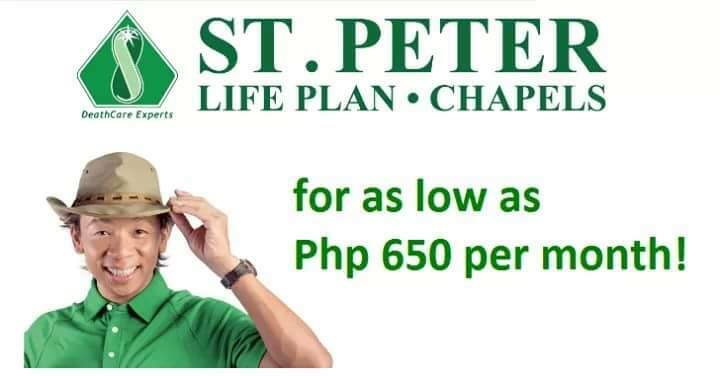 Sis, pumanaw na si Ka Erdy. Totoo ba? (Sister, Ka Erdy passed away. Is it true? ), said my friend Abel. I was shocked. I even told him that the news may not be true. In fact, both of us were in doubt. I sent the same messages to my other INC friends, and phoned my sister-in-law at home. At that time, she was watching INC Spokesperson Bro. Bienvenido Santiago delivered the official announcement of our beloved leader’s death through NET 25 and GEM TV (INC-owned TV networks). Bro. 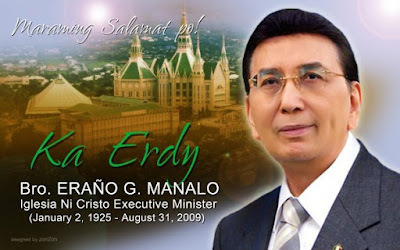 Eraño G. Manalo died last Monday, August 31, 2009 at 3:53 p.m. due to cardiopulmonary arrest. I wanted to go Central Temple right at that moment. I cried. I lost my concentration on my work. I talked to my co-worker who’s also an Iglesia Ni Cristo. It was one of my saddest days of my life. I felt that I lost a father the second time around. My father died nine years ago, a year after my college graduation. Farewell, our beloved Bro. Eraño G. Manalo, the Executive Minister of Iglesia Ni Cristo since 1963 to 2009. It is he who continued the spiritual leadership of his father, Brother Felix Y. Manalo, God’s Messenger in these last days. He spent 46 years of his fruitful life in leading the Church. His physical body will not be here anymore, but his inspiring messages, his constant reminders and advice, and most of all his love will remain forever in our hearts. We promise to remain steadfast in our faith, so we can see each other again in the second coming of the Lord Jesus Christ to bring us all together in the Holy Land. We love you so much, Ka Erdy. The outpouring love and support of the whole Iglesia Ni Cristo continues. Thousands or perhaps millions of brethren went to the Central Temple in Diliman, Quezon City. Despite bad weather conditions, hunger, and the difficulty of queuing up, we, members of INC from different parts of the Philippines went there to pay our last respect to our beloved Ka Erdy. Some INC from other parts of the globe went home hurriedly as soon as they heard the news. I had my share of unforgettable experiences of brethren during the weeklong wake of Ka Erdy. My family and I went to the Central Temple last Saturday (September 5) but we’re not able to go inside for the public viewing. We went home tired, hungry, and sad. After performing our duties in the Sunday worship services, we went there again and it’s all worth it. My sister, sister-in-law, brother-in-law, and I were also to see Ka Erdy for the last time. His inspiring message during the 95th Anniversary Celebration of Iglesia Ni Cristo lingers in my heart and mind. In his message, he reminded us to remain true in our calling and help spread the words of God. No amount of hardships, sufferings and problems could take us away from the Church. We will be members of his true Church until the very end days of our lives. We promise to uphold the words of God and obey the Church Administration to be headed by your son and successor Brother Eduardo V. Manalo. Today at exactly 12:00 noon, Ka Erdy was finally laid to rest at the Tabernacle, INC Complex QC. 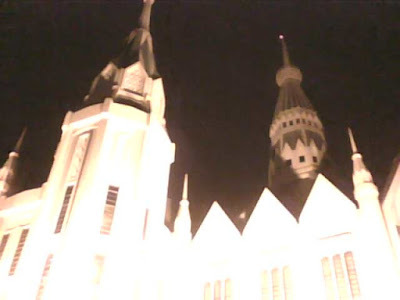 The photo below was taken last night while we are on our way inside the Central Temple. It's also nice to know another INC blogger :) I'm part of Finance here in Makati, Jackson locale. Followed you... hope you do too! 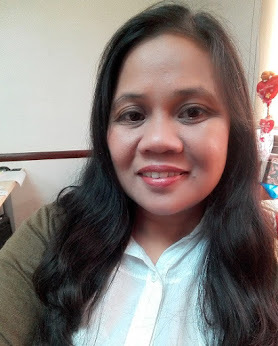 Thanks for visiting my site... happy blogging and God Bless! hi sis Donna! thanks!!! I know few brethren from Jackson.